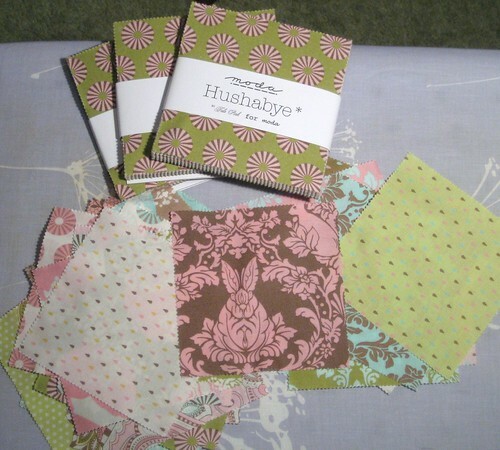 Many of us, it seems, quite lose our senses when it comes to pretty fabrics. We derive such pleasure from simply looking at them, contemplating the possibilities of what to make of them. Sometimes, we can’t bring ourselves to cut into them (I’m perhaps more guilty of that than most, but I’m surely not alone.) We know we don’t necessarily need any more fabric, but one glimpse of a hot new collection and the idea of “budget” goes out the window. eBay, as I may have previously mentioned, is a vile, foul, evil, nasty, bad, vixen-temptress. Fortunately, she is also a fount of pretty stinking good deals on fabric. Provided one doesn’t do something stupid (such as pay $8.00 for a charm pack and $2.25 for shipping an handling on top of that,) excellent bargains are to be had. 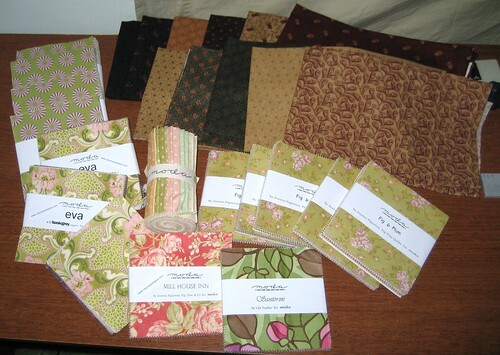 One of my favorite sellers, emeraldcityfabricandcraft, offers free shipping and I can often find charm packs for $5 or less. 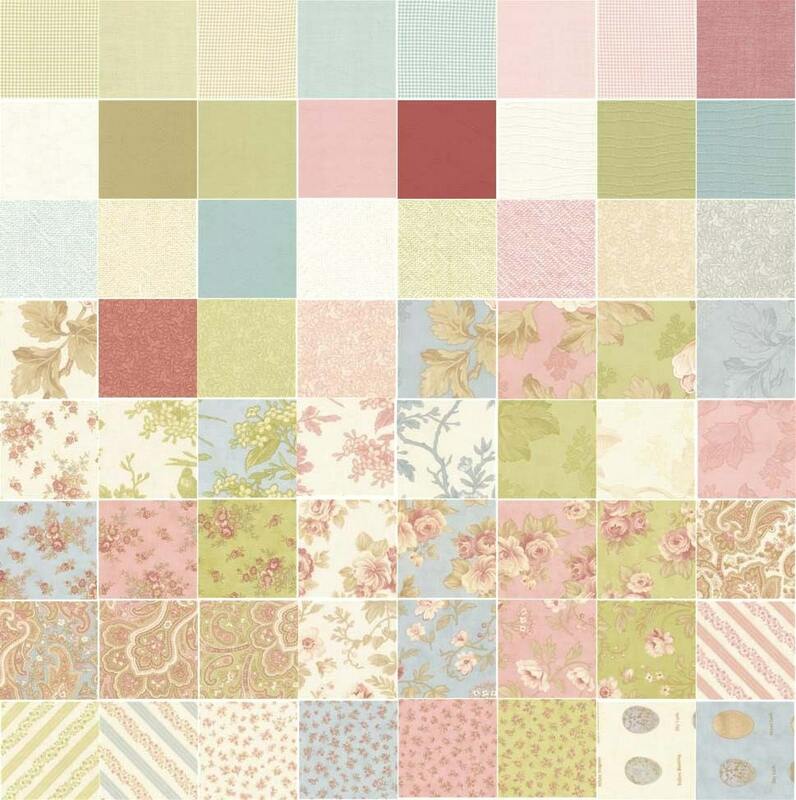 Recently, I’ve nabbed a bunch of Moda (quelle suprise,) including Aviary, Mill House, Fig & Plum, Santorini, Eva, Hushabye, Aster Manor, Evening Mist, Authentic, Sultry… oh my, that looks like a lot. It is. It really really is. But the deals I got were astonishingly good, so that makes it alright. Right? One thing I have noticed, especially with the Eva charms, is there are faded out areas where it looks like the print didn’t fully transfer – is that to be expected, or did I get ripped off? I’ve also seen it in Fig & Plum. Most haven’t arrived yet, but I love everything I’ve received thus far… except the Santorini. It’s too… something. The little martini-olive-type patterns are adorable, but the pinks are quite bright, the greens are quite avacado-y, and the browns and yellows just aren’t quite right. It’s all very … kitcheny. Hm… maybe it’s meant for towels. We shall see… I may use bits of it in something and practice with the rest. Thus far, there have only been three collections I haven’t been wild about – Northern Solitude, Twiggy and Santorini. The rest? Pure, unadulterated joy. On the plus side, I’ve had projects in mind for nearly everything I’ve picked up recently. 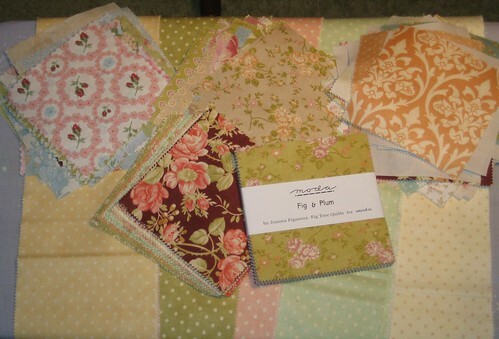 The Mill House, Aster Manor, Fig & Plum and perhaps even the Evening Mist will all end up in our bed quilt. Thanks to Google, I’ve discovered I need 256 charms to cover a king-sized mattress (that’s a handy little page right there,) plus however many borders and such to drape over the sides. The mattress-covering portion is roughly 6 charm packs. 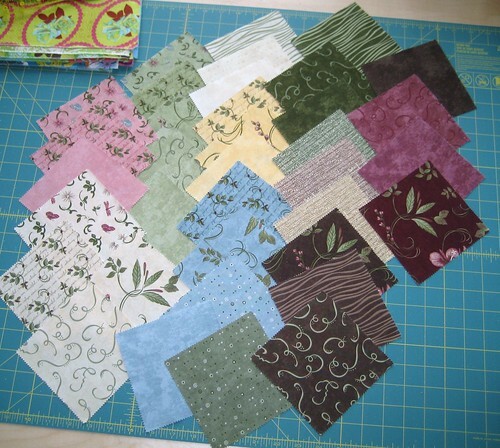 I have more than that, but will be picking out the blues in Aviary, probably, and some of the brighter pinks. I’m not going to do anything fancy – just get them put together. 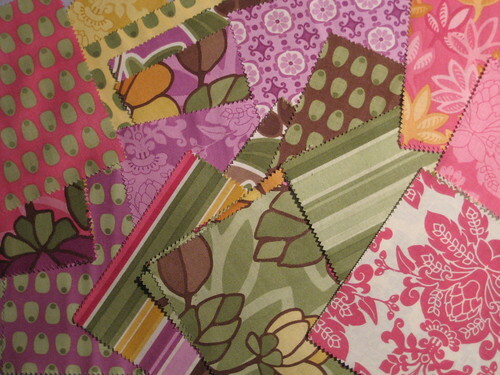 I hope Mike Neir forgives me for asking him to crawl under a flowery, girly quilt. The Kansas Troubles Snow Blossoms will all go into my mother’s quilt, and that will also not be meticulously-wrought, because Mom and I have OMFG Issues, and the quilt will eventually become a symbol of our failures in our relationship and end up packed away, at the Goodwill or thrown out. 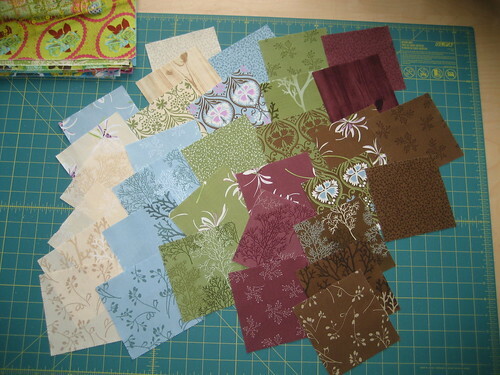 I think I may just cut up the fat quarters into quarters themselves, and do a “macro four-patch.” Or, I may cut them each in half and do a macro lotus brick. It will be backed in flannel to help keep her warm in her lonely old house, something I cannot personally do without the urge to strangle her or defenestrate myself. Seriously! There are kind and gentle bunnies, as in the upper right and somewhat cut-off, but that sucker right in the middle? Devil bunny. This fabric makes me wish I knew someone who was having a baby girl so I could make her a cute ribbon blanket and block. Speaking of the Moda Bake Shop, they have such wonderful ideas and tutorials, but their design and layout is just abysmal. Someone hire them a web developer!! This was just a bad decision. Fortunately, I only hacked up a part of one of the packs, and still have a bunch left over. We’ll see if I can manage something attractive from them. I hope. 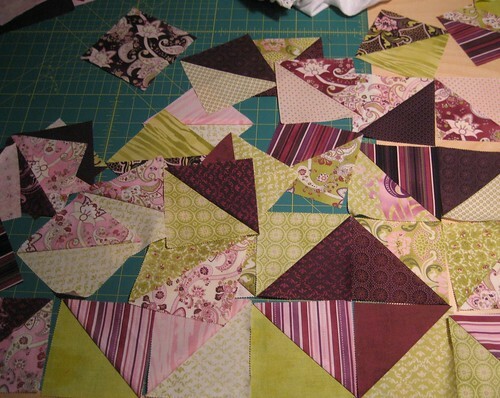 It’s such gorgeous colors and designs… I’d hate to obliterate all of it into a pile of crap. Sounds like you’re getting some great deals. I’m not sure about the faded charms…maybe they’re factory seconds?!?! I’ve never seen any faded in the charms I’ve received. Erin, contact me via email regarding the faded charms . . .
Every time I try something new–a pattern, a recipe–if I don’t like how it turns out I just say “life’s a learning experience!” And go on to the next thing. A friend bought me some of the Fig & Plum for my birthday last year. Beautiful, beautiful stuff. I stay away from Ebay except in my darkest moments. 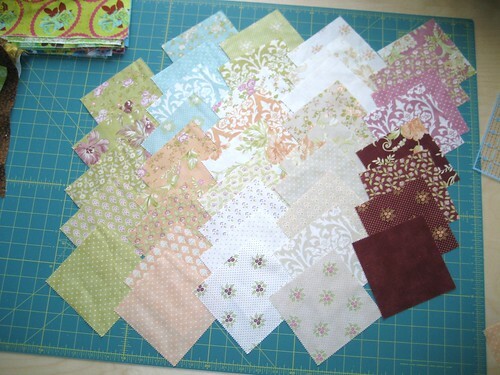 The antique quilt tops and blocks get me every time.